The Louisiana walk in bath might be considered by some to be the perfect retrofit product when considering a bathroom conversion. 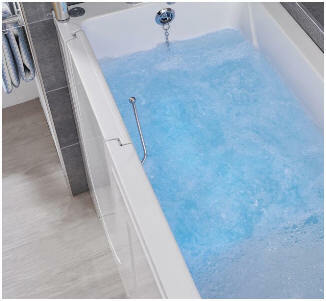 Even if space is at a premium, the Louisiana bath is available with a choice of 1500mm and 1700mm in length. Choosing a Louisiana bath might even give you facilities you previous thought impossible because of space. As its title suggests, the Louisiana bath shower offers shower and bathing facilities. Access is made easy via a hinged glass door and optional screen. Then there is an option of two types of lifting seat - a solid moulded seat or a flexible belt type seat. The Louisiana walk in shower bath will meet with the needs of many different levels of mobility. A spacious 'P' shaped footprint offering a roomy shower, a lifting seat that will gently lower and raise you should you prefer a bath. Furthermore, the Louisiana shower bath is perfect when the various needs of individual family members differs greatly. Carefully positioned air jets deliver a gentle soothing massage - a wonderful experience to ease aches and pains. The air spa experince is believed to offer relief from conditions such as arthritis, rheumatic pains, skin conditions and stress related issues. A centuries-old form of treatment used successfully over the years to cure various diseases as an alternative medicine. Practitioners claim to be able to use light in the form of colour to balance energies that are lacking from a person's body on physical, emotional, spiritual and mental levels. 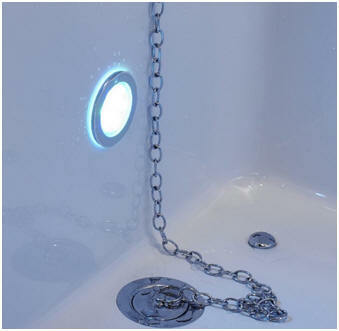 Do you enjoy listening to music while you soak in the bath? Then why not treat yourself to wireless Bluetooth connectivity and play music or radio from any Bluetooth enabled sound source through the built in speaker system. A most practical luxury option for your Louisiana bath. Simply press the button and sit back. 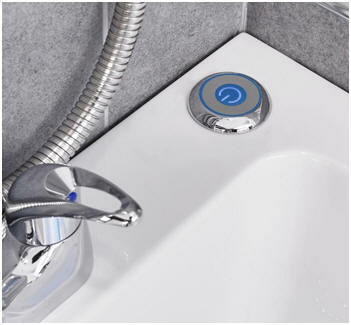 The autofill system delivers water at your desired temperature and when your bath is 'full' it turns the water flow off. This system could be particularly useful as a message against inadvertent flooding. The use of a Thermostatic Mixing Valve (TMV) to limit incoming hot water temperature and prevent scalding is strongly recommended with this item. Please ask if you require more information. The side panel (long panel with door entry) is included with your purchase. 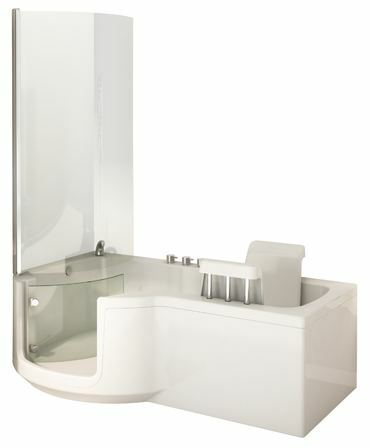 *This bath is available with either a lifting belt seat or a lifting rigid seat at the same price. Should you subsequently change your mind an alternative seat can be purchased. Where the model of Louisiana bath includes a powered lifting seat we offer a FREE visit by a manufacturer's engineer at your convenience to give your installation a final check over for correct operation once installed.